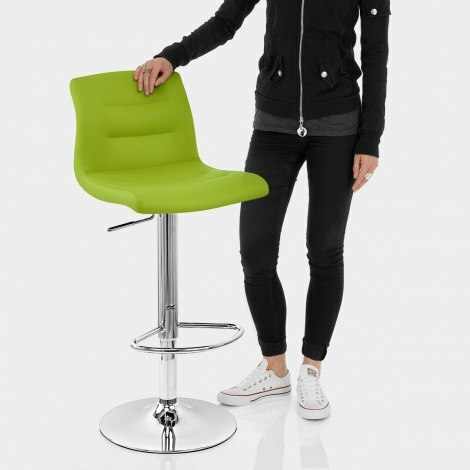 Embrace the Paradis Bar Stool Green, a refreshing take on the modern gas lift bar stool. With a bold design that will instantly revitalise your kitchen bar area, the Paradis Bar Stool is an undeniably fashionable piece with an impressive wow-factor. This sensationally chic stool combines a green faux leather seat with slick and efficient metalwork. The seat is also inlaid with stylish stitch detailing for decorative flair. The gas lift mechanism means the position of the seat can be easily altered while 360 degree swivel makes it easy to navigate any counter or bar area. A rounded footrest provides an ergonomic perch for your feet before a rubber ring tops things off by adorning the underside of the base with a view to preserve flooring. "These stools are great, comfy, fab colour, decent weight"
Very pleased with this product. Arrived within 48 hours of ordering. Colour spot on. Will order again. Excellent replacement stools for kitchen and about 30% cheaper than high street kitchen stores. Bought four in 2014 still going strong just added two more - delighted with style, colour, service.